Does your cell phone need a boost of power? Take a hike! No, for real. A new in-shoe system developed by University of Wisconsin-Madison engineering researchers Tom Krupenkin and J. Ashley Taylor harvests energy generated by walking. The energy is currently lost as heat, but up to 20 watts of electricity could be generated by their technology, storing it in an incorporated rechargable battery. The technology used is called “reverse electrowatting,” which converts mechanical energy to electricity. There is a power density of up to one kilowatt per square meter, and it works within a wide range of mechanical forces. The battery is sealed and protected against water and dirt, and a cell phone would have to temporarily connect to it with a wire. They are working to create a simpler way of transmitting the energy to a cell phone. This could potentially work as a mobile WiFi hotspot and link your phone to wireless internet (I would DIE if my shoes gave me wifi). A constant nearby hotspot could dramatically increase a phone’s battery life, since such low amounts of power would be necessary in order to connect to it. Not only would it take less power to connect to the wifi, but the device battery would also be used to charge the phone if it’s connected to the network, reducing the amount of juice that is zapped away in the phone while browsing the internet. 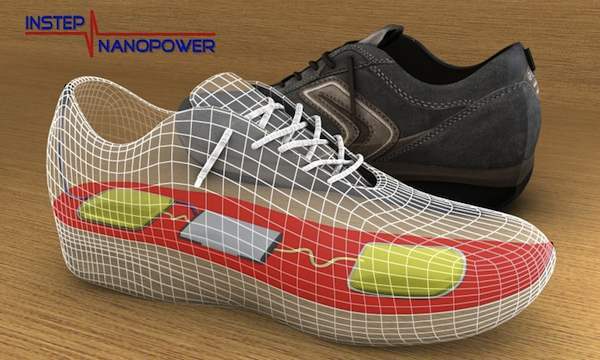 The engineering pair is currently trying to commercialize this through their company, InStep NanoPower.